More than 20 local students are enjoying a summer of hands-on experience in stem research laboratories through the USC Early Investigator High School (EiHS) and the USC CIRM Science, Technology and Research (STAR) programs. Darren Harris, a student at Lifeline Education Charter School, explained what the opportunity means to him at the USC Stem Cell Public Policy Education Forum, held in the Aresty Auditorium on July 12. “I had no clue that with one cell, you can get so much out of it. So it’s actually opened my mind to see what else I can get out of life,” he said. 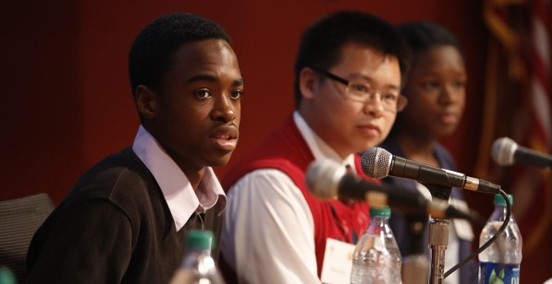 Throughout the forum, high school students shared what they’ve learned, working alongside USC researchers exploring potential treatments for everything from Alzheimer’s disease to radiation wounds. Through the EiHS and CIRM STAR programs, students also attend weekly presentations about ethical and political issues relating to stem cell science and regenerative medicine. The students aren’t the only ones to benefit from the EiHS and CIRM STAR programs. Scientists are also needed to think way outside the box, according to Jonathan Thomas, chair of the governing board of the California Institute for Regenerative Medicine. Thomas spoke of the creative researchers behind “bizarre concepts,” such as the first isolation of human embryonic stem cells and the creation of induced pluripotent stem cells by “rewinding” mature cells into their embryonic state. “Science is a weird thing,” he said. “Science is always looking for new ideas. It’s those new ideas from young people that are going to drive the future of medical research. Other distinguished speakers included retired State Sen. Art Torres, vice chair of the governing board of the California Institute for Regenerative Medicine; Jeffrey Gunter, chair of the Ambassadors for Stem Cell Research at USC; and Eryn Brown, science writer for the Los Angeles Times. Funding for the forum and the EiHS and CIRM STAR programs came from USC Stem Cell and the Regenerative Medicine Initiative; the Eli and Edythe Broad Center for Regenerative Medicine and Stem Cell Research at USC; the STAR program at the USC School of Pharmacy; the Ambassadors for Stem Cell Research at USC; CIRM; and USC Neighborhood Outreach.